The highest standards of physiotherapy services on the borders of East, West, South and North Yorkshire. Our clinic compromises of three treatment rooms and a studio. Two of the treatment rooms are located on the ground floor, which has full wheelchair access from Selby Road. 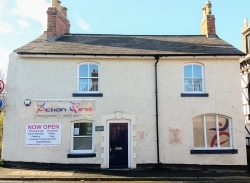 The third treatment room and the studio are on the first floor. Each treatment room is completely private, giving you the confidence that you will not be disturbed and the piece of mind that you are receiving the best care possible. The Studio is a great multi purpose space, it is big enough for 10 people doing an active class or more if the space is being used for a meeting or a club. The space is light, bright, quiet and very calming. We work closely with all of our customers and always look to tailor our services to their individual needs. Our friendly, highly trained team are available to answer any questions or queries by telephone or email. We are open 6 days a week including late nights until 8pm Wednesday and Friday, and Saturday mornings until 12pm. We also provide home visits and have clinics in South Milford and Sherburn. So no matter where you are, Action First Physio are not far away. Most major insurers cover our services, but please speak to one of our team if you have any doubts or questions. Customer parking is now available at the rear of the Downe Arms in Snaith accessed from Pontefract Road, please park in the spaces on the left hand side of the car park signposted Action First Physio.